Efflorescence is "a deposit of soluble salts and bases, usually white in color, that sometimes appear on the surfaces of masonry or concrete construction. "1 The presence of such soluble compounds is common and naturally occurring in all cementitious products and earthen materials, and no manufacturing process or control can eliminate them. Only water and a driving force (evaporation or hydrostatic pressure) are needed to dissolve the compounds and move them to the surface. Typically, efflorescence is noticeable during or soon after construction. During damp weather periods of rain or heavy fog, ample amounts of water will be absorbed into unprotected walls and efflorescence should be expected. Even during dry periods, the water in masonry grout alone may be sufficient to dissolve and move compounds to the surface. Such "new building bloom" on structures is typically easily removed during final cleaning prior to the application of masonry water repellents, and should no longer be an issue. If efflorescence reappears or persists, it is evidence of water entering the wall by some means, and not necessarily through the face of the masonry. Site walls, however, are exposed at top and both sides, and do not typically receive a water repellent treatment. When exposed to damp weather, compounds within the cmu, mortar, grout, and concrete will likely dissolve and migrate to the surface as evaporation occurs. Water from irrigation can contribute by not only wetting the wall, but may also contain salts of its own, resulting in a persistent, heavy build-up of efflorescence. Concrete or masonry materials contain a finite amount of soluble compounds. Left untreated, efflorescence from these materials will diminish and end. 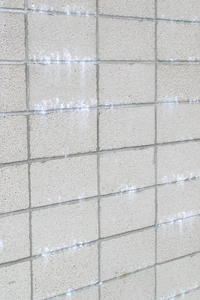 In and of themselves, the efflorescence is usually light enough to be washed off by rain over time, with subsequent wet/dry periods leaving diminishing amounts of efflorescence. You'll notice the great majority of site walls, while exhibiting normal weathering, remain attractive, durable fences. For the rare instances of stubborn deposits, commercially available efflorescence removers can be utilized. Optional additions of integral water repellents can mitigate but not entirely prevent all instances of efflorescence. Efflorescence from the constituents of concrete and masonry is the result of naturally occurring salts and typical exposure to moisture, its remediation is a common, successful process of cleaning and control for buildings, or simply a matter of time for site walls. Sources of the efflorescence are not limited to the masonry wall materials, but may also, or instead, originate from other sources: potable water, soil, or adjacent structures.